Dec 17 Home for Christmas HELP! ‘Tis the season, but not the Christmas season anymore. ‘Tis the season for New Year’s resolutions. We have blogs, newspaper articles, TV magazine shows, tweets, instagram and Facebook posts. ‘Tis the season for the annual ritual of dramatic New Year’s resolutions, fueled by the hope of immediate and significant personal life change. The reality is that few smokers actually quit because of a single moment of resolve. Few obese people become slim and healthy because of one dramatic moment of commitment. Few people deeply in debt change their financial lifestyle because they resolve to do so as the old year gives way to the new. Few marriages change by the means of one dramatic resolution. Is change important? Yes, it is for all of us in some way. Is commitment essential? Of course! There’s a way in which all our lives are shaped by the commitments we make. But biblical Christianity – which has the gospel of Jesus Christ at its heart – simply doesn’t rest its hope in big, dramatic moments of change. The fact of the matter is that the transforming work of grace is more of a process than it is a series of a few dramatic events. Personal heart and life change is always a process. And where does that process take place? It takes place where you and I live everyday. And where do we live? We all have the same address. Our lives don’t careen from big moment to big moment. No, we all live in the utterly mundane. Most of us won’t be written up in history books. Most of us only make three or four momentous decisions in our lives, and several decades after we die, the people we leave behind will struggle to remember the events of our lives. You and I live in little moments, and if God doesn’t rule our little moments and doesn’t work to recreate us in the middle of them, then there is no hope for us, because that’s where you and I live. The little moments of life are profoundly important precisely because they are the little moments that we live in and that form us. This is where I think “Big Drama Christianity” gets us into trouble. It can cause us to devalue the significance of the little moments of life and the “small change” grace that meets us there. Because we devalue the little moments where we live, we don’t tend to notice the sin that gets exposed there. We fail to seek the grace that’s offered to us. So if a New Year’s resolution doesn’t lead to significant personal change, what does? 10,000 moments of personal insight and conviction. 10,000 moments of humble submission. 10,000 moments of foolishness exposed and wisdom gained. 10,000 moments of choosing to repent (turning and going in a new direction). 10,000 moments of courageous faith. 10,000 choice points of obedience. 10,000 times of forsaking the kingdom of self and running toward the kingdom of God. In these small moments he is delivering every redemptive promise he has made to you. In these unremarkable moments, he is working to rescue you from you and transform you into his likeness. By sovereign grace he places you in daily little moments that are designed to take you beyond your character, wisdom and grace so that you will seek the help and hope that can only be found in him. In a lifelong process of change, he is undoing you and rebuilding you again – exactly what each one of us needs! Yes, you and I need to be committed to change, but not in a way that hopes for a big event of transformation, but in a way that finds joy in and is faithful to a day-by-day, step-by-step process of insight, confession, repentance and faith. As 2017 gives way to 2018, wake up each day committed to live in the small moments of your daily life with open eyes and humbly expectant hearts. Do you have any resolutions you want to make or bad habits you want to kick? What is motivating you to want to change these areas of your life? Why might it be “easier” to make one big resolution than 10,000 little ones? What are some elements that make the daily routine of life so difficult? How does the grace of God help you with your 10,000 little decisions? What are some daily spiritual struggles that you are facing? What daily commitments can you make to address these areas of weakness? One of the best things about the Christmas season is the way anticipation builds for the big day. We count down to Christmas with Advent calendars. And the closer and closer it gets to the actual day, the more and more we anticipate with excitement what Christmas morning will actually bring. In other words, our expectations for joy are high. And as the anticipation builds, so does the joy we look forward to feeling. The people of God looked forward to that first Christmas with a similar anticipation, but what they were anticipating was much greater than any present we might be hoping to find awaiting us this year. They’d long been waiting for a Savior to come, and as news spread that He might have finally arrived, their anticipation grew to new heights. And when they knew that Jesus, the One whose arrival they’d anticipated for hundreds of years, was born that Christmas morning, their joy was endless. While we can’t imagine what it must have felt like for the people back then to know that the King they’d been promised had finally come, we can share in their joy this Advent season. For just as God filled their hearts with His joy, He can fill ours with the same. And His joy—a deep, unmatchable, life-changing joy—is bet­ter than anything else we might be anticipating this Christmas season. As Advent moves on, ask God to fill your hearts with joy. Focus your anticipation on the celebration of His birth. And, ask Him to make your life a living testament of His joy this Christmas. What’s one thing you’re anticipating with excitement this holi­day season? What do you think real joy feels like? How is it different than happiness? What’s one way you can find the joy of Christ this Christmas? How can you help others experience that same joy? Lord, you are the One we’ve all waited for, and we’re so grateful that you came to Earth for us all those years ago. We’re so grate­ful for the way you saved us and the joy you made possible for us. Help us to remember that what we have to be most excited about this holiday season is You. Give us your joy and help us to share it with others. The best way to spread Christmas cheer is singing loud for all to hear, right? Well, we think so! Make a point to interject some joy into your family’s holiday season by doing something fun and unexpected. One evening this week, tell your family to put on their best Christmas paja­mas. Then, load everyone up in the car and take them to a local coffee shop for some hot chocolate. But in order to get their hot chocolate, your family has to sing a Christmas carol to the barista behind the counter! Take your hot chocolates to go, and hit the road together to explore some of the best Christmas lights your neighborhood or town has to offer. Blast the Christmas music as you go, and sing along to some of your favorite holiday tunes together as a family. It may sound silly, but we promise it will create some fun, joy-filled memories for your family this holiday season. Is there anything crazier than the Christmas season? The hustle and bustle of holiday shopping, family gatherings, church services, work parties, Christmas performances, and the general busyness that comes with the season. There’s just something about the Christmas season that seems to raise the collective blood pressure of the population, huh? What’s interesting is that this frantic feeling of frenzy is the exact opposite of what this season is meant to be. While the rest of the world is pulling us toward presents, parties, and planning, Jesus is simply leading us toward peace. In a world marked by tragedy, division, and corruption (sound familiar? ), Jesus came to bring His long promised peace to the people. His birth permanently turned the page from pandemo­nium to peace, letting all of us know that even when everything around us feels crazy, we can still have peace. Lasting, eternal, deep rooted peace. When chaos swirls around you this Advent season, choose peace. When you feel the stress of family dynamics or the tug of tension threatening to break you, choose peace. When you feel rushed and spread thin, choose peace. When you feel the pull toward perfection, choose peace. And when you feel the weight of weariness in this world, choose peace. So as this Advent season marches on and we move closer and closer to Christmas, no matter what’s happening around you, cling to Jesus. Cling to the One who brings peace. Make His peace the banner over your Christmas season. What is one thing that really stresses you or your family out during the holiday season? What does peace look like to you? How can you make a choice to let the peace of Christ permeate your holiday season? God, you are the bringer of peace. You are the One who can sustain us when life feels chaotic. As Christmas approaches, help me to choose peace. Fill me with your peace and focus my eyes on You. Grab some pens, small pieces of paper, and your family! Have ev­eryone in your family write down on pieces of paper some things that really stress them out about the Christmas season. Have each person fold their answers up and put them in the middle of the table. Before you take a look at their answers, read John 14:27 with your family. Talk together about what peace means to each one of you and how peace is possible in our lives because of Jesus. Then, start going over the things each of your family members wrote on the pieces of paper. As you talk about the things that each of you said might be stressful this season, brainstorm ways you can instead choose peace. so that’s God’s name is glorified and his kingdom is proclaimed. I don’t know about you, but I’ve never been good at waiting. I’ve never been good at not knowing what’s ahead. Looking forward to an unknown future with hope and excitement just doesn’t come naturally to me. I doubt it does to most. That’s exactly what the people were facing before the birth of Christ. They’d been through so much—the good, the bad, and the unimaginably terrible—over the years. Floods and famine, war and wandering, slavery and suffering—these people endured it all, but always with the ever present hope of a Savior promised to come. They’d long been shrouded in darkness, waiting for a light to come. But the darker the cloud, the brighter the sun that eventually shines through. And for them, that light to come was King Jesus. Though they waited in darkness, they did not wait without the hope of a Savior who was promised to come and shine an eternal light on their lives. Waiting on God doesn’t exactly look the same for us as it did for them. We have the privilege of knowing how their story ends. The Savior they hoped for did finally come, and not just for them but for the whole entire world as well. For us. The waiting is still daunting, but we can wait with a fresh hope because we know the King has come. I don’t know what kind of darkness you might be waiting under this Christmas season. I don’t know how heavy the cloud feels over your heart. But I do know this: for those living in deep dark­ness, a light has dawned. As we begin this Advent journey and look forward to celebrating the birth of the Savior who changes lives, do so with a fresh hope that the darkness will not win. A light will break through. What does waiting look like in your life? How does the wait make you feel? Do you struggle to look forward to the future with hope? Why or why not? How can you remember the hope of Christ and the promise of the light to come this Advent season? God, thank you that we don’t have to wait without hope in this life. We know that just as it was true for your people back then, the promise of a Savior is true for us today, too. Take the weight of darkness sitting heavy on our lives and replace it with the light of your hope this Advent season. At dinner one day this week, ask each member of your family to share one thing they’re hoping for and waiting for this Christmas. Depending on the ages of your children and family members, answers could include anything from gifts they hope to see under the tree, prayers they hope to see answered, or an experience they hope to have. After everyone has shared, read Luke 2:1-20 (what we know as the Christmas story in the Bible) and talk as a family about how those people were waiting for something bigger than anything we could imagine that first Christmas. They were waiting for Jesus! 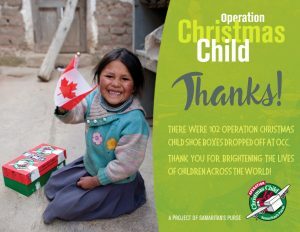 Just as we have hopes for what we want to happen this Christmas season, the people then did, too. Then, pray together as a family, asking God to help you remember to have hope this Christmas season. Advent is a season filled with expectation. It’s a time when we remember the world waiting for a coming Savior, and celebrate the way the world changed when Christ was born. It’s a season filled with the light and love of Jesus, the King, born to save us. But if we’re being honest, it’s also a season filled with craziness. As Christmas approaches, the focus of Ad­vent sometimes gets lost amidst the chaos and busyness that comes with the holiday season. As you journey through this devotional, take time to think through the questions, spend time in prayer, and make time to participate in the activities that involve your family. Our prayer is that as you turn your eyes to the coming Savior this Christmas season, your hearts will be transformed as you remember the birth of the King who came to save us. After their stay with you, your household will take Mary and Joseph to their next host home and enjoy some refreshments together. 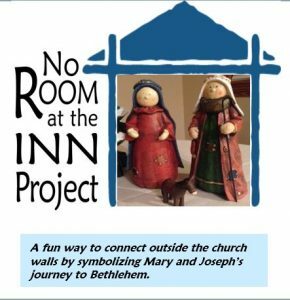 That home will take them to the next home and enjoy some time together … and the cycle continues until the final family brings Mary and Joseph to church on Christmas Eve.